Using the ultimate in grooming tools we can remove the undercoat and loose dead hair so you don’t have to keep removing it from your carpets and furniture. 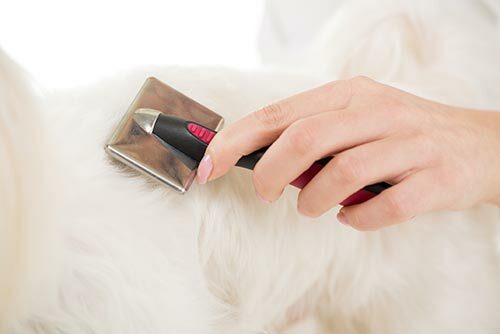 Dog Shedding – A ‘Hairy’ Situation! Loose dog hair gets everywhere, but unless you own a hairless breed it’s simply a fact of life. Dogs lose hair, it’s a totally natural process and not something that you can stop, or ‘cure’. There are also certain times of the year, or certain situations, where your dog is going to shed more than normal. There are many different types of dogs, there are many different types of coats and some will shed more than others, or shed more noticeably than others. Breeds that were originally created to live/work outdoors (especially in cold climates), such as German Shepherds, Newfoundland’s, Alaskan Malamutes, Pomeranians and so on have tons of hair – both the longer ‘outer-coat’ hairs and the softer, denser ‘under-coat’. This means that they tend to lose a lot of hair and dog shedding is definitely going to be part of life for their owners. However, it’s not only these longer-coated breeds that are prone to heavy-duty dog shedding! Coats which are much smoother and shorter such as Labrador Retrievers, Golden Retrievers and other similar breeds too shed. Dog breeds who have long, silky outer-coats and little, or no, undercoat (such as Yorkies, Lhasa Apsos and Afghan Hounds for example) tend to shed less than many other breeds, so do dog breeds with curly coats such as Poodles or Bichon Frise. These could be considered to be low shedding dog breeds. Wire-haired dogs such as many of the terrier breeds need regular clipping or stripping to keep their coat mat-free and ‘in order’. The up-side of this is that a regularly clipped/stripped coat will shed less too. So, to sum it up… pretty much all dogs shed but that’s not any real consolation for dog owners who spend what seems like half their waking hours removing dog hair from their clothes, furniture, carpets… even coffee cups. When it comes to controlling or reducing the amount of hair your pet is losing, regular and proper grooming is the key. In addition to brushing/combing your dog, a bath now and then helps to remove loose hair and dander. Bathing once or twice a month should be enough, although if you or someone else in your family has an allergy to dog hair, bathing weekly may be better as long as it doesn’t irritate the dogs’ skin. Always remember to use a very mild shampoo such as a puppy formula, Oatmeal Shampoo or hypoallergenic formula (no medicated or highly-scented ones please! ).